This is a group fitness class for adults of all ages and fitness levels. Classes will incorporate different fitness routines including short metabolic, long metabolic, cardio circuit, strength circuit and hybrid type workouts. Each participant will receive a kit that they must bring with them to each session. Class length is 45 minutes, 2 times per week. This class is designed for athletes ages 13+. Classes will concentrate on muscular endurance, muscular strength, power, agility, speed and quickness, functional flexibility and functional mobility. Each athlete will receive a kit and must bring it with them to every session. Class length is 45 minutes, 2 times per week. Dynamic Fitness Personal Training Studio is excited to announce our 12 week New Year New YOU Shred Class. This class is 45 minutes in duration and designed for all fitness levels. This Shred Class includes cardio bursts, strength exercises and abs exercises. This is an interval fitness class and each interval is designed to keep you moving from exercise to exercise without lengthy breaks. This maximizes calorie burn and fitness gains in a shorter time period. Challenging ab routines bicycle and scissor kicks, reverse crunches and more! Camaraderie and encouragement from your classmates! Ready for a full hour of heart-pounding interval training? Then join us for our more advanced Fitness Competitor’s Class! We push things to the limit in this class; focusing on speed, agility, balance, strength and core exercises. Sprints – in all directions! Comraderie and encouragement from your classmates! DeAnna helps her students release external distractions and exist in the presence of their bodies through alignment-based vinyasa yoga. She empathizes on the importance of proper alignment with a strong focus on the link between breath and fluidity. 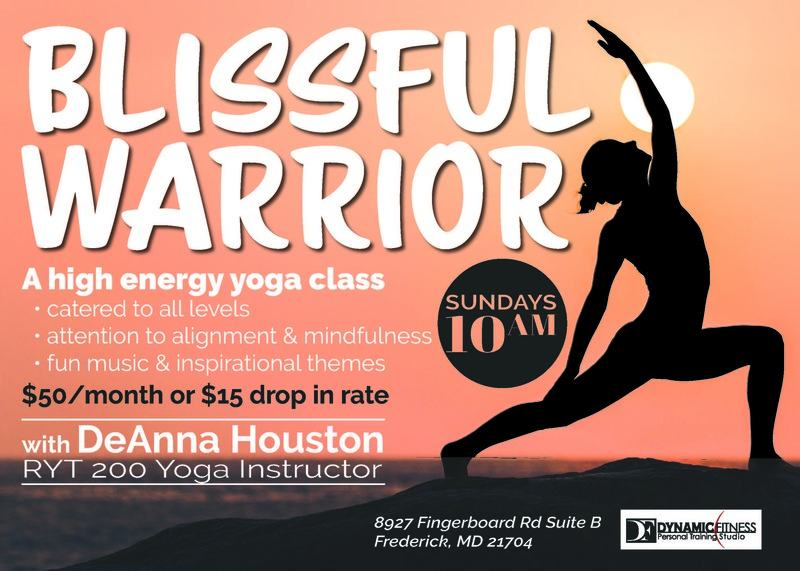 This class will leave you feeling blissful and as strong as a warrior! Click Here to Sign Up! Dynamic Fitness’s Kids Performance program is a different and fun approach to health and fitness for children and early adolescents. Quille’s coaching is group oriented with an individual focus for each participant. Physically, all kids develop greater balance, coordination, agility, strength, and flexibility. Cognitively and emotionally, there is an improvement in participants’ team work, self confidence, awareness, and ability to follow instruction while regularly attending the program. Classes hold regular discussion of nutrition, anatomy, and the importance of safety and communication during exercise. Fitness routines are versatile and continuously changing, but always include plyometrics, calisthenics, light-weight-lifting, balance building, and games. Ages range from 8-12. Classes meet Mondays and Wednesday afternoon and evenings.